Catherine Benincasa, born in Siena at a date that remains uncertain, was favored with visions from the age of seven. Becoming a tertiary of the Dominican Order, she acquired great influence by her life of prayer and extraordinary mortifications as well as by the spread of her spiritual writings. Her continual appeals for civil peace and reform of the Church make her one of the leading figures of the fourteenth century. 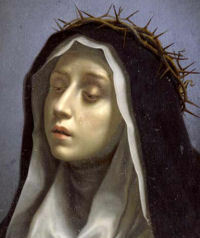 Worn out by her mortifications and negotiations she died in Rome on April 29, 1380. According to the 1962 Missal of St. John XXIII the Extraordinary Form of the Roman Rite, St. Catherine's feast is celebrated on April 30 and today is the feast of St. Peter of Verona. He was born about 1205 at Verona. His parents were Manichaeans, but he was converted and entered the Order of Preachers with the ambition not only of preaching the faith but of giving his life for it. He had his wish, for in the course of his apostolic work he was assassinated by the Manichaeans on the road from Como to Milan in 1252. Historically today is the feast of St. Hugh of Cluny, a prince related to the sovereign house of the dukes of Burgundy. He was an adviser to nine popes. Catherine, the youngest of twenty-five children, was born in Siena on March 25, 1347. During her youth she had to contend with great difficulties on the part of her parents. They were planning marriage for their favorite daughter; but Catherine, who at the age of seven had already taken a vow of virginity, refused. To break her resistance, her beautiful golden brown tresses were shorn to the very skin and she was forced to do the most menial tasks. Undone by her patience, mother and father finally relented and their child entered the Third Order of St. Dominic. Unbelievable were her austerities, her miracles, her ecstasies. The reputation of her sanctity soon spread abroad; thousands came to see her, to be converted by her. The priests associated with her, having received extraordinary faculties of absolution, were unable to accommodate the crowds of penitents. She was a helper and a consoler in every need. As time went on, her influence reached out to secular and ecclesiastical matters. She made peace between worldly princes. The heads of Church and State bowed to her words. She weaned Italy away from an anti-pope, and made cardinals and princes promise allegiance to the rightful pontiff. She journeyed to Avignon and persuaded Pope Gregory XI to return to Rome. Even though she barely reached the age of thirty-three her accomplishments place her among the great women of the Middle Ages. The virgin Catherine was espoused to Christ by a precious nuptial ring which, although visible only to her, always remained on her finger. Patron: Against fire; bodily ills; Europe; fire prevention; firefighters; illness; Italy; miscarriages; nurses; nursing services; people ridiculed for their piety; sexual temptation; sick people; sickness; Siena, Italy; temptations. Symbols: Cross; heart; lily; ring; stigmata. If you have never done so today would be a good time to read some of St. Catherine's Dialogue. Learn more about the Order of Preachers founded by St. Dominic. Peter entered the Dominican Order in 1221, the year when St. Dominic died. He was a zealous preacher, and as Inquisitor converted many heretics. While attending school at the age of seventeen, he was asked by his uncle, a heretic, what he was learning. Candidly the boy replied, "The Apostles' Creed." Neither threats nor honeyed words from father and uncle were able to shake the boy's steadfast faith. Years later, when death was near, he once more recited the Apostles' Creed that he prayed so courageously in his youth. The mortal stab soon fell, and he received the martyr's crown. Symbol: Dominican with a large knife in or splitting his head; holding a knife; man with a knife in his head and a sword in his breast. As he lay dying, it is said, Peter wrote the word Credo on the ground with his own blood. To us also may the Creed be a source of blessing in life and in death! To that end we might occasionally meditate on one or another of its articles. Devoutly, reverently the words should pass our lips, especially at Mass. Remember that martyrs' blood has flowed for all its phrases. Read more about St. Peter of Verona. St. Hugh was a prince related to the sovereign house of the dukes of Burgundy, and had his education under the tuition of his pious Mother, and under the care of Hugh, Bishop of Auxerre, his great-uncle. From his infancy he was exceedingly given to prayer and meditation, and his life was remarkably innocent and holy. One day, hearing an account of the wonderful sanctity of the monks of Cluny, under St. Odilo, he was so moved that he set out that moment, and going thither, humbly begged the monastic habit. After a rigid novitiate, he made his profession in 1039, being sixteen years old. His extraordinary virtue, especially his admirable humility, obedience, charity, sweetness, prudence, and zeal, gained him the respect of the whole community; and upon the death of St. Odilo, in 1049, though only twenty-five years old, he succeeded to the government of that great abbey, which he held sixty-two years. He received to the religious profession Hugh, Duke of Burgundy, and died on the twenty-ninth of April, in 1109, aged eighty-five. He was canonized twelve years after his death by Pope Calixtus II.